Over the past few weeks, I have been able to gradually built up the mileage of my long run. The long run, to me, is the key in feeling like more like my old (pre-hip surgery) self again. However, the problem with running now is that because I still don’t feel “normal,” I really need the distraction of others to take my mind off my frustrations and to keep me running. Unfortunately, there aren’t always people available to run with and I am still too uncertain about my abilities on any given day to jump back in for any significant distance with my old running group. After a complete waste of a day yesterday (it was rainy and I was in quite a “mood” – so I literally sat around binge watching Orphan Black) I knew that I needed to get my run in today no matter what. So when yet again, nobody was available to run with distract me, I laced up my shoes and hit the pavement on my own. While I have always preferred company on my long runs, I never used to have a problem completing them on my own. I have ran as long as 22 miles by myself before – so this morning’s 12 miler should have been no big deal. But admittedly, I was scared. Scared of my leg acting up. Scared of coming face-to-face with how much fitness I have lost. Scared of spending almost 2 hours stuck with these discouraging thoughts. But I did it. I forced myself to run at an “easy” pace at the beginning because I knew that an “easy” pace wouldn’t feel easy a few miles in (I was right). I find pacing long runs especially difficult when I am by myself because I tend to go out too quickly just to get the run over with. I also ran around my neighborhood rather than at the local trail, so the scenery was more concrete and construction than trees and shrubbery. Aside from the scenery, the run itself wasn’t pretty either. I looped around my neighborhood so many times, it took all of my willpower not to stop each time that I got within a quarter-mile radius of my house. But I kept reminding myself that: (1) I was capable of doing this and (2) if I cut the run short, I would regret it as soon as I could breathe again. Another hard thing about pushing yourself after injury is learning the difference between injury pain and out-of-shape pain. While there is still undoubtedly some of the former, the reason I wanted to stop so bad was the latter. Since stopping when you feel out of shape isn’t going to help you get back into shape I decided I should probably just keep going. After the first week post-op, there were still a lot of highs and a lot of lows. However, the connecting thread seemed to be that as each day went by, I start feeling more and more like myself again. Like anything in life – it takes time. Sometimes the progress would come so slow that I wouldn’t even notice. But it’s amazing when all the sudden I was able to do something (without thinking about it) that I couldn’t do a week ago. At physical therapy, the stationary bike was integrated into my visit as a warm up. 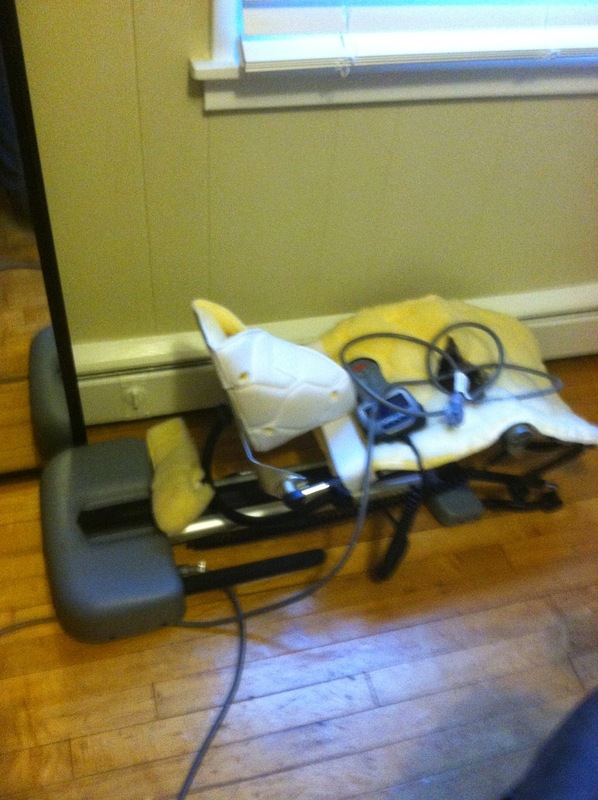 The surgeon said that even from the first few days post-op, I would be able to substitute the stationary bike for time on the CPM machine. However, I felt so weak and stiff for those first days (not to mention I didn’t have a bike readily accessible) that I don’t think the bike would have been very productive. I remember sitting at my last appointment pre-op, asking about how soon I could start integrating physical activity back into my daily routine. I was absolutely thrilled when the doctor told me that I could start biking (at zero resistance) beginning the day after surgery. At the time, I was thinking that I’d be able to use the bike as a work out. I figured that after all of these months injured and constrained to the bike, I would just continue on until I was ready to run again. Stupid, stupid, me. 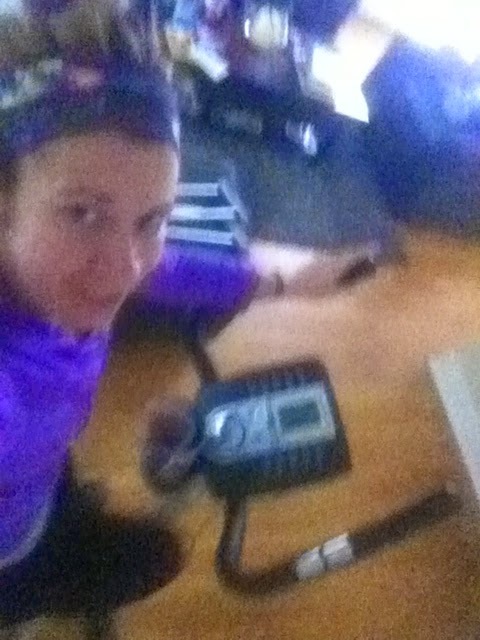 Riding a bike after surgery is completely different than riding a bike for exercise. The purpose is passive motion, not fitness. The funny thing is, you don’t even care anymore. Just getting on the stationary bike was a challenge. It took a lot of maneuvering and hoisting myself up with my arms to actually get situated on the saddle. Actually riding the bike also turned out to be quite challenging – as I was barely peddling fast enough to keep the machine on and the physical therapist had to keep a separate timer for me. It absolutely killed me to watch the minutes tick on by and realize that I wasn’t even cycling at a 12 min/mile pace (for those of you who don’t bike- this is NOT FAST). Depressing – a little. Lesson of the day: you can’t compare the past (in this case, the speed I used to be able to cycle at) with the present. The tenth day post-op marked the first day I remember really starting to feel like “myself.” I was actually extremely antsy and anxious to get up and get moving. For someone who can’t sit still (just ask my husband – I can’t ever just “be”), this marked a substantial improvement from the past few days. The problem was that by this point I was left alone to manage myself during the day – and what I was able to manage was pretty much nothing! Typically, I’m a “bored eater” and at this point I would just have been chowing down on anything. This doesn’t happen when you’re on crutches, as moving from the spare bedroom where I had set up camp, to the kitchen, was enough of a journey in itself! Naturally, after having an unseasonably cool summer, the weather was absolutely beautiful during this stretch of time and all I could do was look out the window. Trying to stay positive was essential to surviving this stretch. Day Eleven marked my first return to humanity. I attended my husband’s Crossfit competition for a few hours (with much assistance). It was bittersweet – it was fabulous to get out of the house for the first time and finally get some fresh air. However, watching people work out when you are hobbling around on crutches was difficult. I don’t think I had ever been so envious! Another thing I started to realize was how the world is not set up for people with moving limitations (and how unaware people are of what it means to be partially immobile). Bags laying haphazardly everywhere. People who abruptly walk and stop. Doors that don’t open. Limited (and far) parking. Granted, this may not have been the best setting to use as a basis of comparison- but it really started to open my eyes. Thank God for having others who were willing to look out for me – because there would be no way I could have navigated on my own. One thing that annoyed me was when people automatically assumed that my injury was from running. Coming from people I knew, this wasn’t offensive because it was a logical question. But when a complete strangers asked… I don’t know if I have a look that just screams out “runner” or what. And yes – while running may have sped up the process (in that because I had a misshapen bone, being active in any capacity would have caused greater wear and tear) running did NOT cause my injury! Aside from my mini outing, another monumental event on Day 11 was climbing “Mt. Everest” (the stairs that lead up to my bedroom) and actually going to sleep in my own bed! Clearly I over did it on Day Eleven. At the time it didn’t seem like I was doing very much (essentially just alternating between sitting and standing with lots of assistance). But on Day Twelve my body was extremely angry with me. I guess transitioning from not moving for hours to moving more frequently really took a toll. When I got home from that afternoon I was absolutely exhausted, but I didn’t realize the magnitude of the harm that I did until I tried to go to sleep that night. I woke at about 2:00 a.m. in excruciating pain. Because this was the first night I had made it up the stairs and back to the actual bed, I stirred restlessly because I didn’t want wake my husband up. I was in so much pain I couldn’t think straight. It almost felt as though gravity was crushing down on my hips, causing everything to ache. I eventually decided that it would be best to move back downstairs and set myself up on the recliner with the ice machine. Upon waking, the entire next day I was incredibly achy and sore. Even though I felt okay crutching around the previous day – I think that all that activity really did a disservice to my body. I spent all day laying around – moving back into the ice/CPM/sleep routine. All of that boredom I had felt a few days prior completely dissipated with the pain. Day 15 – Goodbye CPM Machine. You Will Be Missed. It had been a battle to get insurance to cover the CPM machine in the first place, so when they finally agreed to cover it for two weeks I was ecstatic. However, the time flew by and soon I found myself saying goodbye. It was bittersweet because although I knew that the loss of the CPM machine marked a step closer to recovery, it was scary to disrupt the routine that I had created. I think the scariest aspect was trying to make sure that I would still recover properly without a key piece of my recovery equipment. After spending three or more hours a day in the CPM machine, it seemed that there was a gaping hole in my recovery plan. While the bike was a an acceptable substitution, it also required substantially more effort. A typical night in the CPM machine. Much more relaxing than the bike! A week and a day post-op and I was finally allowed to add in more “substantive” exercises at PT (clamshells (without the band), bridges, steps, etc.). I was also able to ride the bike a little faster (10:14 mile down from 12:00 just a week ago). As pathetic as it may seem – I was very proud to take nearly 2:00 off my bike “mile” time. At that point, it was the only way I really had to measure progress! On Day 17 I had my post-op doctor appointment to have my stitches removed and to have the PA evaluate my progress. I arrived ridiculously early (my dad drove me to the appointment and he is obsessive about being on time). After my surgery, I made the mistake of forgetting to ask about accessible parking permit for my car, so we ended up having a bit of a trek from the parking garage into the doc’s office. 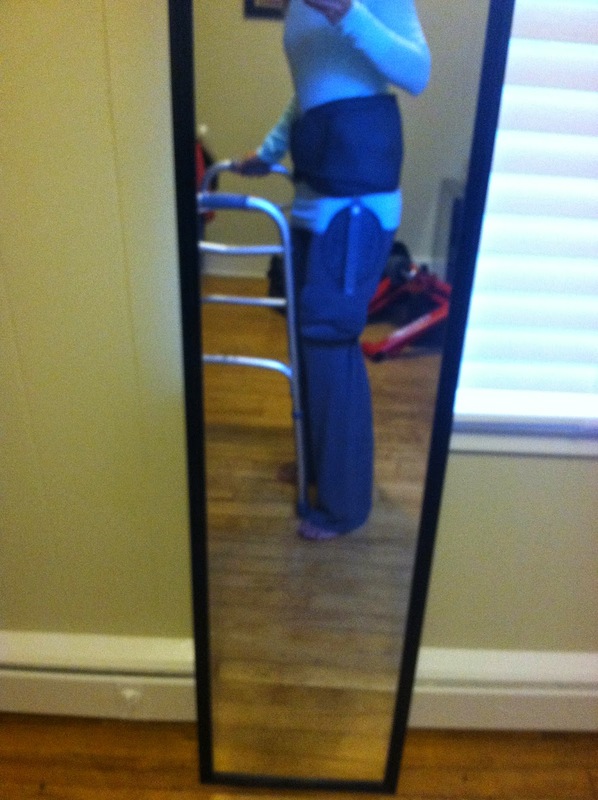 The PA told me that this was a very exciting day because the harsh restrictions would be lifted I would be allowed to start reintroducing regular movements “as tolerated!” This meant increasing the weight I was allowed to bear on my bad leg by about 25 lbs every 3 days until I was fully weight bearing. I was also cleared to attempt to do things that require bending (as long as I did it slowly) like putting on my shoes. What a game changer! I also had a productive day taking care of things on my To-Do List. My dad had the entire day off work, so he was able to drive me around a bit to go to the DMV to get the handicapped sticker and to the bike store to get a skewer for the bike trainer. However, once we got home and got the bike set up on the trainer, it turned out that this would not be an acceptable substitution this early in my recovery. The trainer was too high off the ground and was difficult to climb onto. The flexion, even on a traditional bike, was also still too great. Regular road bikes also have higher cross bars, which was nearly impossible to swing my healing leg/hip over to climb onto the saddle. After realizing that the trainer was not going to work and still having no replacement for the CPM machine, I decided that finding a cheap bike on Craigslist would be my best option. While I had a gym membership, I still was on crutches and unable to drive. Luckily, exercise equipment is one of those things of which there is far greater supply than demand. 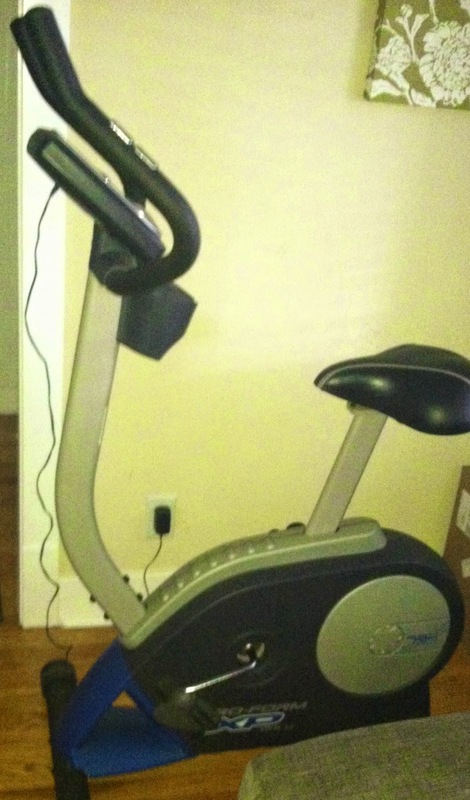 While there is undoubtedly a bunch of junk to sort through, I found a great bike priced at just $125. After talking the seller down to $100, we had a deal and I had a new bike! Buying the bike was the best decision I could have made. While nothing fancy, it was a bike that I was able to get on and off of without assistance. It was also incredibly convenient to be able to hop on and peddle at any time during the day. The worst part was simply the discomfort of trying to sit on it for prolonged periods of time, but I found that if I could distract myself with a magazine or a book time went by much faster. Again, I know it has been a while since my last post. For those that have been following my journey, you know that I have been batting an injury since the beginning of this year. However, I have avoided providing detailed updates in my blog because for a long time I was very uncertain as to how I was going to proceed. However, since I ultimately decided to have the recommended surgery, I would like to share my experience. As I was struggling through the long diagnostic process and weighing my options, I found the blogs of others to be very insightful. I hope that by sharing my own experiences I am able to help others understand this often misdiagnosed injury – from diagnosis through recovery. I apologize in advance for the overly lengthy post (and for any spelling/grammatical errors)! Since some of my past posts discuss the onset of my injury and my struggle in achieving a correct diagnosos, I’ll avoid rehashing all of the details here. In sum, I had been experiencing hip/glute/piriformis issues since early February. By June, my biomechanics became so poor that I had to stop running entirely. After months of experimenting with various alternative treatment options (physical therapy, dry needling, acupuncture, chiropractic care, ROLFing) I finally had an MRI and MRA. The imaging revealed a labral tear/detachment and femoroacetabular impingement (FAI) in my right hip. My doctor explained that this meant that the cartilage buffering the ball and socket joint in my hip had torn/detached and that this was likely caused by a misshapen bone rubbing against it (analogous to a square peg trying to fit in a round hole). The doctor also explained that this injury was not the type of injury that would resolve itself with rest. Rather, if I ever hoped to return to my former level of physical activity (which was high mileage running), it appeared that surgery was my best option. He referred me to two highly regarded surgeons for further consultation. The consultation process further provoked a roller coaster of emotion. Leading into the first consultation, I resigned myself to the fact that I would have to have surgery. However, when I met with the first surgeon, he didn’t seem as certain. While he acknowledged that the MRA revealed the labral tear/detachment, he suggested that the root of the problem may have originated elsewhere. I left this appointment feeling upset and confused. While I certainly didn’t want to have surgery, having an answer was far better than delving back into the great unknown. From the beginning I committed myself to seeking two opinions, so I decided that it was counterproductive to react until I had the opportunity to consult with a second doctor. My appointment with the second surgeon brought further confusion. After reviewing my imaging and performing a physical examination, he agreed with my primary doctor and believed that surgery was my best option. The one thing that caused slight concern was the fact that my symptoms were somewhat atypical for this injury. Usually, the symptoms of a labral present as a pulling/clicking/popping sensation in the groin area. For me, the majority of my pain came from the back (specifically the SI joint) and piriformis. Also, rather than experiencing chronic pain, my main complaint was severe biomechanical issues with my gait (both while running and walking). Specifically, my knee felt like it was locking and my hip felt like it was being tugged down. This was complimented by an aching SI joint. To propel myself forward, I was forced to turn my right foot entirely outward to compensate. Like my primary physician, the surgeon confirmed that this injury wouldn’t repair itself. He also explained that the longer that it went untreated, the more difficult it would be to make a full recovery. At the end of the appointment I scheduled an appointment for a cortisone injection. The cortisone injection resulted in even more confusion. The purpose of the cortisone injection was largely diagnostic. Specifically, the injection is often used to confirm that the hip is in fact the origin of the pain. So when the injection did nothing whatsoever, I was convinced that I was again faced with the prospect of starting the diagnostic process all over. To my surprise, the surgeon still believed that based on my explanation of symptoms (the fact that my complaints were largely biomechanical and not “pain”), my limited range of motion, my imaging, and the fact that months of no physical activity combined with aggressive “alternative” conservative treatment options brought no improvement, that surgery still was my best course of action. Prior to officially scheduling my surgery, he also had me take further imaging and consult with a back specialist to firmly rule out my back at the source of pain. Once the back specialist gave me the go ahead, I scheduled my surgery date. From the date of my last appointment through the date of my surgery, I felt as though a doomsday clock was ticking over everything I did. I didn’t really discuss the procedure with many people, other than family and a few close friends and colleagues. In short, I was in complete denial. Even the day before surgery, I still didn’t truly believe that it was going to happen. Things finally started becoming real when the post-op medical devices were delivered to my house. I spent most of the day consulting with insurance and making sure the house was set up for my recovery. I eventually fell into a restless sleep. The continuous passive motion machine – not as scary as it looks! The day of surgery I was absolutely terrified. I think in part, I never really believed that I would go through with the procedure, or that by some act of divine intervention it really wasn’t going to happen. When I woke up in the morning, I still felt as though I was only going through the motions. I arrived at the hospital at about 6:30 a.m., with a check in time of 7:00 a.m. My dad had already arrived (he has a propensity for always being hours early, no matter where we are going). I am usually a pretty talkative person, except when I’m nervous. Sitting in the silence of the waiting room was surreal, as I ruminated over the fact that in just a few short hours I would be on the operating table. While the procedure itself scared me, it was the anesthesia that really freaked me out. For the hundredth time, I questioned whether I was doing the right thing and reminded myself there was still time to back out. Reality finally hit me when I was issued a hospital bracelet. At that moment, I realized that surgery, which had seemed so abstract, was finally going to happen. A little after 7:00 a.m. the nurse called me back to the room. Everyone at the hospital was very friendly and kept me preoccupied as they ran through their list of preliminary questions. Next, I changed into a hospital gown and the nurse came over and hooked me up to an IV. The IV itself posed a bit challenging because my hands are so small. I was nervous when my entire body became chilled from the fluid, but the nurse told me that this was normal. I felt immediately better when they covered me with the heated blankets. The nurse also gave me a sedative, after which I began laughing hysterically. Shortly after, I became dazed and felt sleepy. A few minutes later, they told me that they were going to wheel me into the operating room. I was surprised because during the hundreds of times that I imagined the procedure, I thought I would already be asleep at this point. In the end it didn’t really matter, as I don’t remember much else from that time on. When I started to wake up after coming out of surgery, I had an oxygen mask on and continued to fall in and out of a dreamlike state. I became frustrated and kept raising my hand (I’m still not really sure what I was trying to accomplish with that). It was a bizarre feeling – like being trapped in between sleep and reality. Most of the recovery part is a daze. I tried to eat a few animal crackers but my mouth was extremely dry and it was like trying to chew chalk. I had to keep gulping water and apple juice to take even the tiniest bites. By the time I was finally released from the hospital (a little after noon), the first challenge was getting into the car. I was ultimately wheeled out in a wheelchair and then picked up and slid across the back seat of the car so that I could keep my leg straight. Getting out of the car and attempting to get into the house was a complete nightmare. It was just me and my husband, who I could immediately tell had no idea that I would be this immobilized. Our house has about five steep steps that you have to climb before you reach the front door. After quickly realizing that there was no way I would be able to climb the steps using the walker or crutches, the only means of “climbing” was to be lifted up and set on each step one-by-one on my one somewhat stable leg. For the first 48 hours following surgery, I couldn’t lift my “bad leg” more than half of an inch. Every little movement for the rest of the day was a challenge. I felt like I was in that scene from Kill Bill where Uma Thurman is willing herself to wiggle her toe. I used all of my remaining energy to move from the ice machine to the CPM machine. Aside from the pain (which wasn’t as bad as I expected) the most notable thing was the giant weight that I felt had finally been lifted off my chest. Until it was done, I didn’t realize what a toll the looming surgery had taken on me. As soon as it was over, it was like I was a whole new person who had one goal – to recover. The first day post-op started with me jolting awake at 1:30 a.m. and having to use the bathroom. Of course, even if I had been able to maneuver myself at all at that point, I still couldn’t have done so because of the “boots” that you are required to sleep in. I somehow managed to lull myself into another nap until about 4:50 a.m. and decided it was finally time to get up. Because the regular bedroom is in a converted attic space, I set up a makeshift “bed” on the couch downstairs. The room that formerly was used solely for the treadmill has become my own personal dorm room – complete with a futon, reclining chair and cable TV. These are the boots that you have to sleep with to make sure your feet stay pointed up. Yes – they are as uncomfortable as they look! My mom came over the day after surgery to take care of me since I was completely unable to do anything on my own and my husband had to go back to work. My body still felt incredibly beat-up from the surgery (and from trying to recover) and I drifted in and out of sleep all day. No matter what I was doing, my eyelids grew heavy and I nodded off. The one big outing on Day 1 was my trip to physical therapy. Filling out the initial consultation form was aggravating, since at this point I had to mark that there was nothing I was able to do on my own. The actual session itself was extremely low key. Since I was only about 24 hours post-op, all the therapist could do was move my leg a bit and give me some simple exercises to re-learn how to contract my muscles on the injured side. Getting in and out of the house was still a big struggle and I also still didn’t have much of an appetite. Day 2 started similarly to Day 1. I woke up in quite a bit of pain. My left foot (the “good foot”) and left side of my rib cage hurt quite a bit, presumably because the left side of the body had been entirely responsible for dragging the rest of my body around the house. My mom came again early in the morning as my husband left for work. She already noted how much better I was moving on my own compared to the day before. The first two days, I couldn’t move at all without the injured side being braced by someone else. Even something as simple as getting up out of a chair became a 10 minute ordeal. By the second day after surgery, I was already moving around much better and could do more on my own. Trying to recover from an injury is like being stuck somewhere between being a baby (learning to walk again) and being elderly (being frustrated not being able to do the simple things that you used to be able to do). In some ways, you are constantly aware of your limitations. Relying on others for everything, especially when you are used to doing everything on your own, is incredibly humbling. Even the simplest things, such as getting dressed and putting on shoes, require assistance from someone else. At other times, you have to remind yourself how limited you are. There are moments where I felt like I was making great progress…and then something would happen. For example, one day I was scooting around the house with the walker and then *gasp* I dropped my phone. 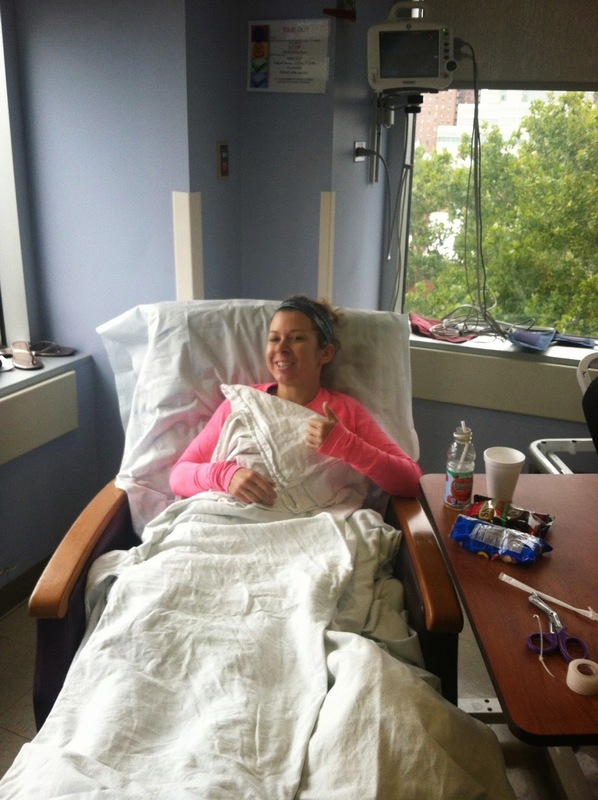 Post-surgery, there were many menial things I couldn’t do – like pick things up off the ground. In such a short time your world-view shifts. A minor annoyance that you wouldn’t think twice about about on a normal day quickly became its own event. 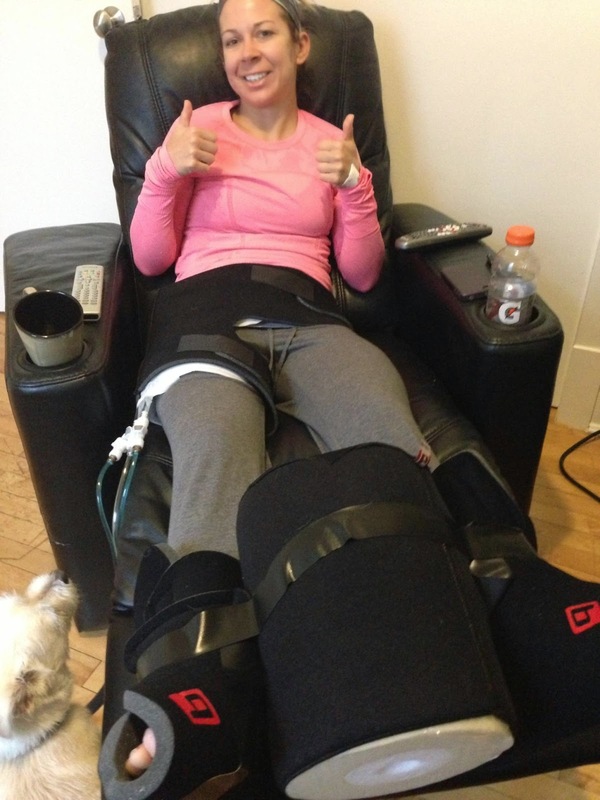 Giant leg brace and walker – these are the tools for success! Day 2 was also a big day because I could finally remove the bandages. Honestly, the process of removing the bandage at times hurt more than the incision itself. The actual padding was very sticky and it felt like trying to rip off a giant band aid. The initial bandage they applied was large – about the size of a sheet of paper. I was pleasantly surprised when the actual wounds themselves appeared much smaller. I also took my first shower post-op, which again took a disproportionately long time compared to the simplicity of the actual task. I actually had to wash my hair in the kitchen sink and then rinse off in the bathroom, which again made me feel like a small child. Day 3 post-op I was filled with an unusual feeling of serenity. Even though my movement was incredibly limited, I slowly began to realize how truly lucky I was. First and foremost, I realized how blessed I was to have a strong network of family and friends willing to help me. Those close to me were beyond helpful – not only assisting me with meeting my daily needs but also setting me up so that I would be able to care for myself when everyone else had to return to work. I had my second physical therapy appointment early in the morning. 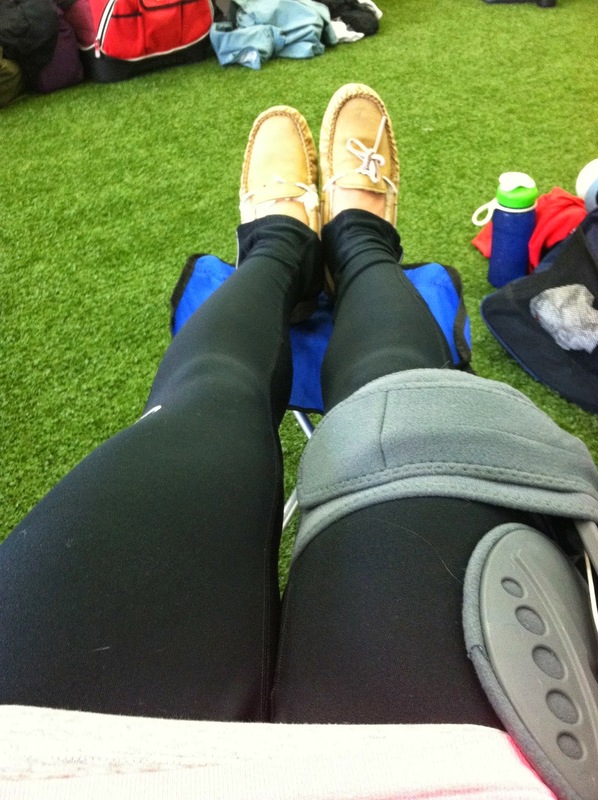 Again, the therapy session was primarily focused on bringing small movement back to the injured leg. I also learned how to go up and down stairs on my crutches. While I was still not ready to attempt the steep flights of stairs inside of my house – it certainly made getting in and out of the house much easier. When you’re 28 years old, crutches also tend to draw a lot less attention when out in public than a walker! Following the appointment, I even felt well enough to make my first real “trip” outside of the house and we stopped at Starbucks on the way home. I was even able to sit inside at a table for a few minutes without too much discomfort. It was nice to feel like a real person again! 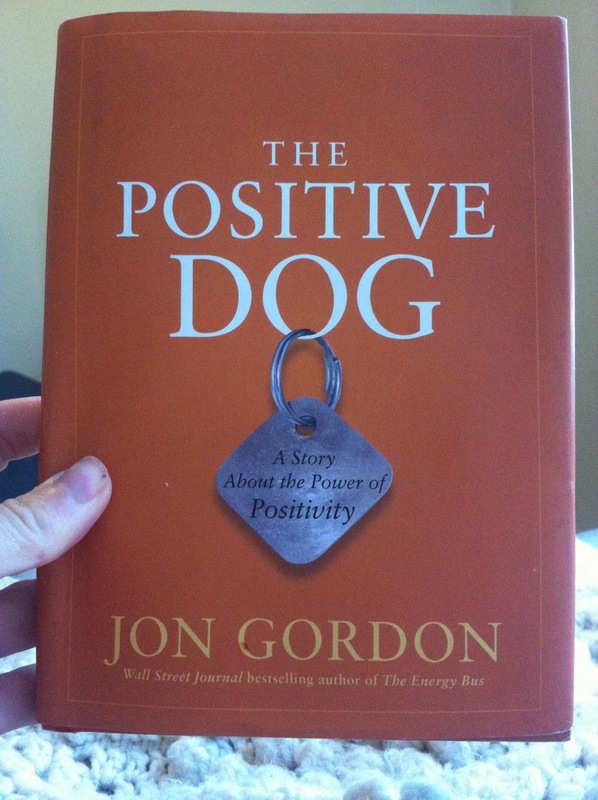 The day after surgery, my mom brought me a book called The Positive Dog. 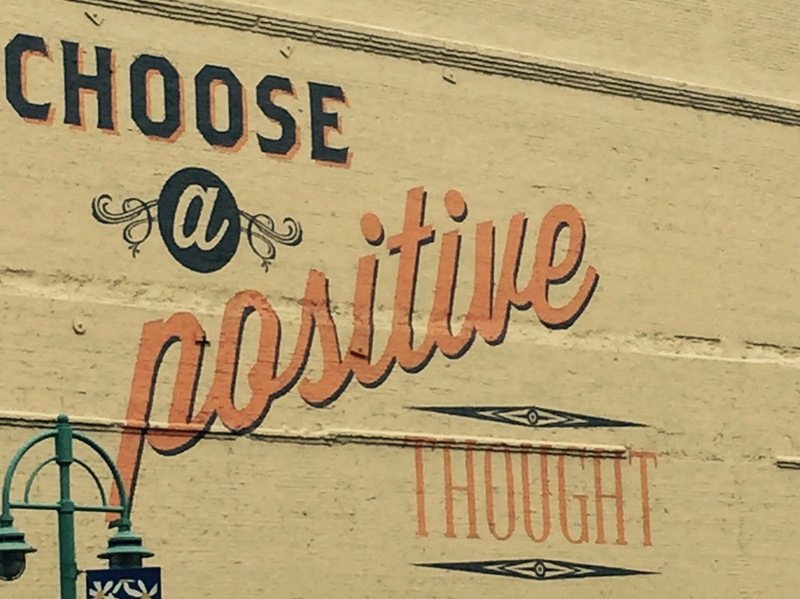 The book is fairly straightforward and discusses the importance of having a positive attitude. I’m not sure if she planned it that way, but it ended up being a great message to hear while trying to recover. Even my own dogs were looking at the bright side and getting used to this new lifestyle! By Day 4 post-op I was finally starting to feel more like myself. Sleep was still difficult and I continued to wake up in quite a bit of pain. However, I would feel much better once I started moving around a bit. I could also tell that I was on the road to recovery because I was getting extremely restless. Every other day I had been perfectly happy lounging around and sleeping, as even the tiniest amount of effort would leave me absolutely exhausted. By Day 4 I was eager to get moving! It didn’t help that the weather outside was beautiful (not quite as cold and rainy as it had been the previous days) so I actually started to feel like I was “missing out.” Sadly, my big event of the day was accompanying my husband to Sports Clips while he got his hair cut. It was so nice to be out of the house, even if it was only for about a half-hour. Otherwise I had a very lazy morning. Once I returned home, the remainder of the day was spent switching between the ice machine and the CPM machine. 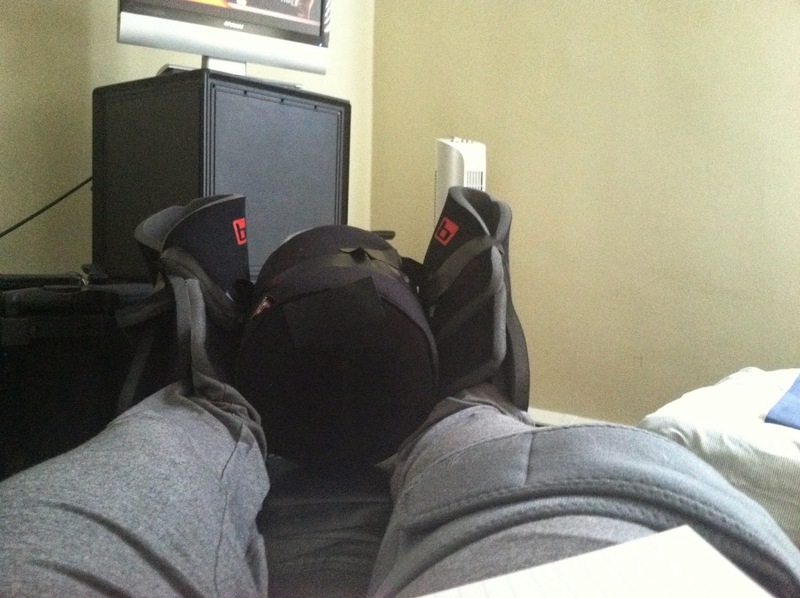 Sitting with the ice pads and feet pads. Apparently, I also now like to give lots of thumbs-up. My parents and my sister stopped by in the evening and cooked us dinner. Having guests over was a much welcome distraction from the otherwise monotonous day. Guests are even better when they do all the cooking for you! The first few days following surgery, I constantly amazed myself with how much I was improving each day. On Days 0 and 1 I was wholly incapacitated – relying on others to do just about everything for me. Each day after that, my self-sufficiency improved. When evaluating my daily “wins,” I couldn’t help but think of my Facebook Newsfeed and the many baby updates (ex: “at three months, little Johnny can roll over, smile, and has mastered tummy time”). While I truly enjoy watching my friends’ children grow, as a non-parent I don’t think I ever truly appreciated the significant of these events. Now, as I reflect over my post-op accomplishments I have a renewed appreciation for those learning (and relearning) how to move. I found myself exercising great restraint in not posting every milestone (ex: “Today I could sit up by myself! Today I could bear weight on my leg! Today I was able to pick something without dropping it!) as they might seem a little odd to those that didn’t know I had surgery! After Day 5, my progress seemed to plateau. By that time, my skill set included being able to move from seated to standing on my own, bending (albeit in an incredibly awkward position), preparing food (kind of – food preparation involved an incredible amount of hopping around on one foot and setting food items on the counter, then pushing it forward, hopping to it, and pushing the item forward again) and generally navigating around the first floor of my house. My greatest fear during these days was forgetting to be careful with the injured leg and making abrupt or awkward movements that would irritate my healing. There were a few times where I moved to abruptly and my body was very quick to remind me how weak my leg still was! Another thing that didn’t seem to be improving was sleep. According to the post-op guidelines, you are supposed to sleep in the “boots” for an entire month following the surgery. Since my first day post-op, at best, I had horribly restless sleep. Without fail, each night I would wake up sometime between 1:30 and 3:30 a.m. Upon waking, I would feel incredibly uncomfortable and wanting to jump out of my skin. Even when I could fall back asleep, I would wake up again as soon as someone could take me out of the boots. I also continued to wake up with my ribs on the left side (the side opposite of my injury) hurting. Since the pain had continued for more than a week, I did go to the doctor to rule out anything serious (just to be safe) since the weeks after surgery you are more susceptible to complications. Luckily (and as I suspected), the pain was likely just a side effect from the medicine. 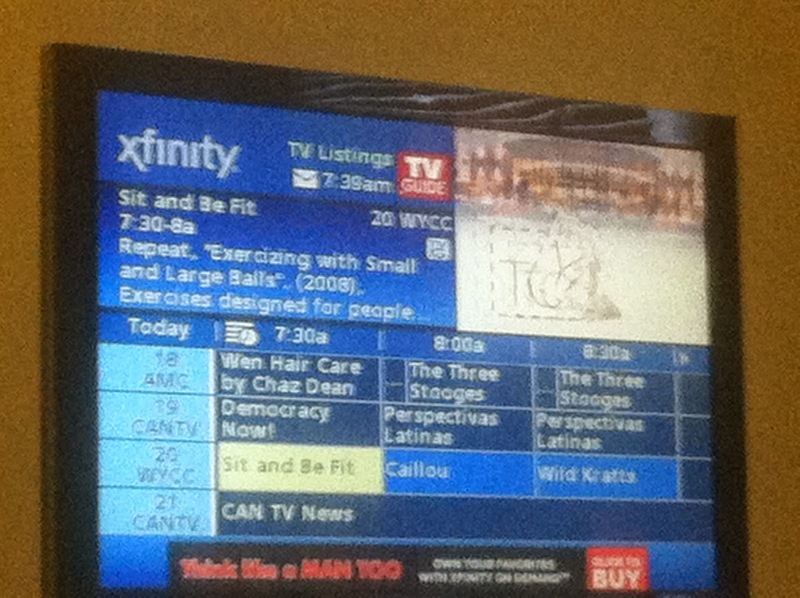 Finally a workout I could do – Sit and Be Fit! I entered into 2014 with aggressive goals on all fronts. As the months continued to pass, I was forced to put on the breaks and reevaluate my expectations with regard to training. While some years plod away like a marathon and others fly by like a sprint – this year has felt very much like a fartlek run. A fartlek workout (“speed play” in Swedish) is characterized by continuously switching paces from fast to slow throughout the run. Like the fartlek, this year has had moments of weakness punctuated by moments of great strength. As with any workout, I am certain that the strength built (and rebuilt) through this experience will only make me stronger and more motivated moving forward.